Isn’t it amazing what we can read from watching body language? As I pulled into a parking spot, I watched from a distance as a mom (out for what appeared to be a fun family outing) took a major wipeout on her bicycle. Her front wheel must have hit something — it wobbled a bit and seemed to go in one direction while the rest of her bike went in the other. Her body could only manage opposing forces for so long; seconds later she and her bike crashed in a big heap on the side of the bike path. Our routine is a simple one. Every night after stories, I tuck each child into bed. When they are settled in their cozy nests surrounded by those 2 or 3 stuffed animals they insist on snuggling with, I reach over to hug and kiss them good nite. "Sweet dreams, I love you" – all those important words get said. Those are the words that water the garden, the words that cause everything to grow. But I am beginning to realize that right before sleep is the perfect time for planting too. Why not pull out a seed or two of inspiration and plant it softly in their ear, where hopefully it floats to their brain and begins to germinate and sprout. The picture is still in my mind – my blond-haired son proudly holding his pink balloon at the local county fair. 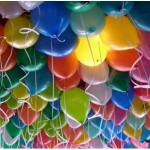 Of all the bright, vivacious colors in the Balloon Man’s massive bundle, he wanted the pink one. Because after all, pink was his favorite color. At the grown-up age of 6, he was neither aware nor concerned of the unspoken 4-word rule all most kids know to follow: pink is for girls. It didn’t matter to him that in the kid world, pink basically equaled Princess. That generally speaking, girls wore pink and boys wore blue. That his baby sister’s bedroom walls were painted a soft, pale, powder pink while his were a soothing, deeper shade of Costa Rica blue. Or, that his Kindergarten buddies were choosing green and red and blue as their favorite colors. My son liked pink.